Trusted Reviews has tested a combined rucksack and shoulder bag from Kata. The rucksack is called Kata 3N1-30 and easily converted from a rucksack to a shoulder bag. The bag also has a rain cover shield and “Thermal Shield Technology” to ensure optimal camera protection. Trusted Reviews ends up giving the Kata 3N1-30 a “Trusted Reviews Recommended” award and an overall score of 9 out of 10 points. The Kata scores highest on build quality and design while scoring a little lower on value. It has a lot of room and the rucksack/shoulder bag combination works great. The only downside is the lack of strap for tripods. 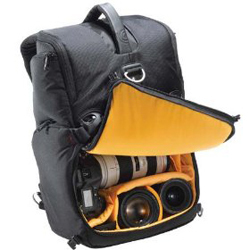 Read the full review of the Kata 3N1-30 camera rucksack / shoulder bag here.